MINI BAG FAUBOURG IN COTONE INTRECCIATO DETTAGLIO FOULARD "ERMANNO SCERVINO"
GIACCA CORTA IN CADY ROSSO "COMPAGNIA ITALIANA"
ABITO MINI IN ORGANZA DI SETA STAMPATA "ERMANNO SCERVINO"
MAGLIA IN VISCOSA CON INTARSI IN PIZZO "ERMANNO SCERVINO"
GIACCA DI PELLE RICAMO LASER "CLIPS"
ABITO IN CADY ROSSO DETTAGLIO FIOCCO "COMPAGNIA ITALIANA"
ASSUNTA SIMEONE BOUTIQUE has been operating in high-end fashion and luxury accessory section since 1979. A prestigious boutique and point of reference for woman´s fashion for the excellent quality of services and the right choices taken as a multibrand. 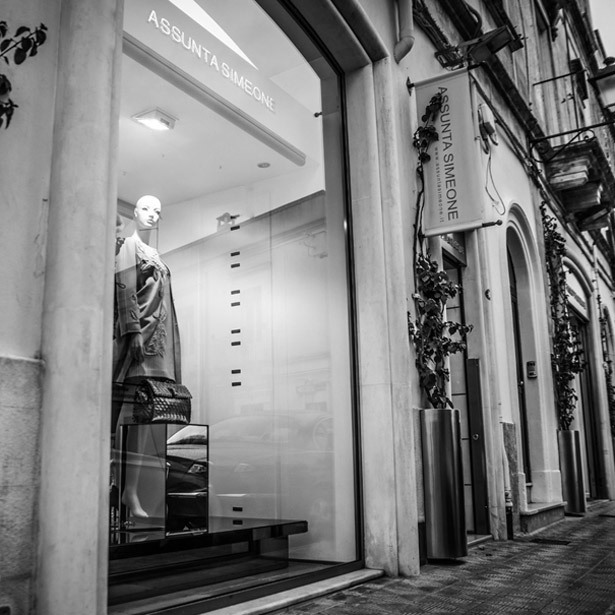 The boutique is situated in south of Italian penisula, Apulia, in Martina Franca province of Taranto. Martina Franca, is an elegant town, located at the centre of the provinces of Taranto, Brindisi, and Bari, a few kilometres from the Adriactic and Ionion seas. The international land of tourist destination, for the seas, the Barocco, the “Trulli” and the wonderful Farms.